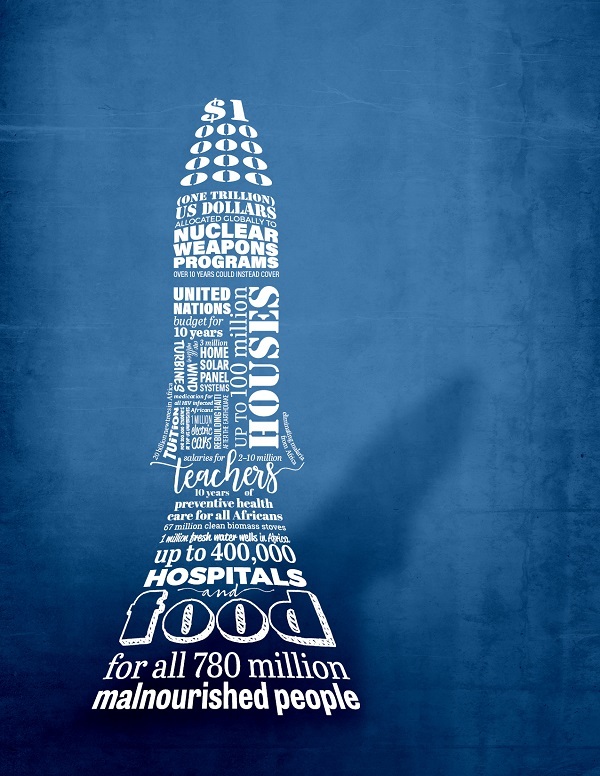 During the next ten years about 1 trillion dollars will be spent globally for maintaining, modernizing and upgrading the nuclear arsenals in the nine nuclear countries. This wastes tax-payers’ money on weapons systems which put civilization at risk. The danger of a nuclear war caused by growing tensions, unforeseen conflicts, irrational decisions or technical accidents is increasing. Those making the weapons and their delivery systems have a vested interest in keeping this risk high, in order to justify the exorbitant nuclear weapons budgets. They are operating in direct opposition to the needs of people and the planet. Count the Nuclear Weapons Money will highlight this irresponsible wastage, and what the funds could instead be directed toward. Count the Nuclear Weapons Money will physically demonstrate the colossal nuclear weapons budget, and relate this directly to important human, social and ecologic issues that could instead be funded with some, or all, of this money. The amount of 1 trillion dollars will be publicly counted by hand, note by note. As it is impossible to do this with one trillion 1-dollar-notes (it would take about 19,000 years) we will count one million notes each of $1 million value. The counting process will then take 7 days and nights. Each day will focus on one or two areas of economic, social or environmental need for which the money could better be spent. As these issues are represented in the Sustainable Development Goals (SDGs) adopted by the United Nations in 2015, we will highlight the SDGs, and how a global reduction in nuclear weapons spending could assist in the implementation of SDGs. A key focus will be on funding climate protection and the phase out of fossil fuels in order to prevent excessive climate change – the other existential threat to humanity. As this action is being undertaken in the USA, we will also highlight how nuclear weapons spending in the USA negatively impacts on federal budgets in areas of social need, and impacts on local communities. The $100 billion spent annually on nuclear weapons is a theft from the tax-payers of the USA and other nuclear-armed States, and from the people of the world. His words are particularly true of nuclear weapons, and other weapons of mass destruction, the use of which would indiscriminately kill civilians, wipe out cities, and possibly end civilization as we know it. What could the nuclear weapons budget instead cover? 1 million fresh water wells in Africa ($5 billion). Under the non-Proliferation Treaty (Article VI), the nuclear armed States are obliged to end the nuclear arms race and negotiate to achieve global nuclear disarmament. Under the UN Charter (Article 26), the Security Council (which includes the main nuclear armed States) has an obligation to develop a plan for disarmament in order to release resources for economic and social need. 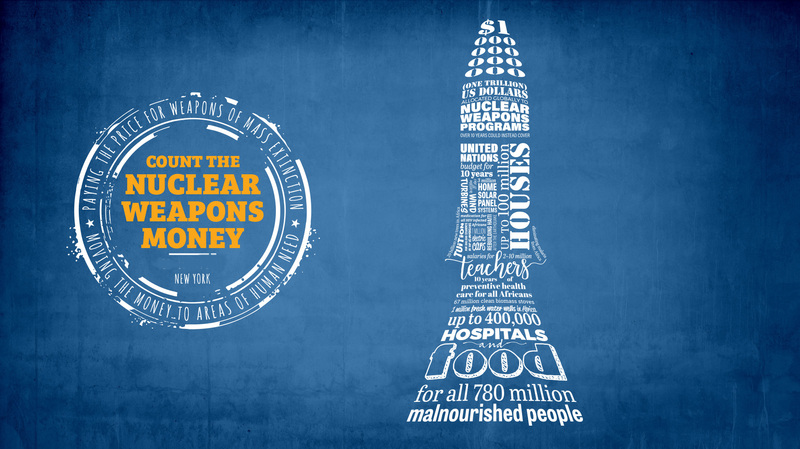 Count the Nuclear Weapons Money is an action to encourage the nuclear-armed States to implement these obligations. The project shall be realized in front of the UN Headquarters and in other public places in New York during UN Disarmament Week, October 24-30, 2018. During UN Disarmament Week governments meet at the United Nations to discuss disarmament issues and adopt resolutions, including on nuclear disarmament. The money will be counted into a glass/Perspex container by consecutive teams of two people each hour. On one (or more) of the days we plan for Count the Nuclear Weapons Money transparent container would be next to the knotted gun statue in the UN courtyard just inside the security which would give great visuals and maximum exposure to those visiting the UN (staff, governments, NGOs and tourists). For some days the container for counting the money will be put on a flat-deck truck and taken to different locations in New York, representing programs of social and economic need that are not being met due to low budgets, whilst billions are being wasted on nuclear weapons. The counting teams are a mix of all ages, nations and social levels: celebrities, activists, politicians, UN officials, diplomats, artists, refugees, school kids, representatives of the different SDGs and just normal citizens. Included in the counting teams will be Laureates of the Nobel prize and Right Livelihood Award (‘Alternative Nobel Peace Prize’). To get attention worldwide we will create a live stream video so that anyone anywhere can follow the counting process, see what the money instead could be used for and give their own comments. We also plan to employ a public relations company to ensure maximum global media coverage. We will also have representatives registered for the UN High Level Conference, participating in the deliberations, submitting proposals on reducing nuclear weapons spending, and building support from like-minded governments and non-governmental organisations.